My main trades and areas of interest before climate change mitigation and sustainable development are international business and management. This brought me to focus early on India. So when I discovered today’s book via The Daily Show with Jon Stewart I knew I had to read what promised to be a fantastic book on India’s past, present and future. And the least I can say is that I wasn’t disappointed. 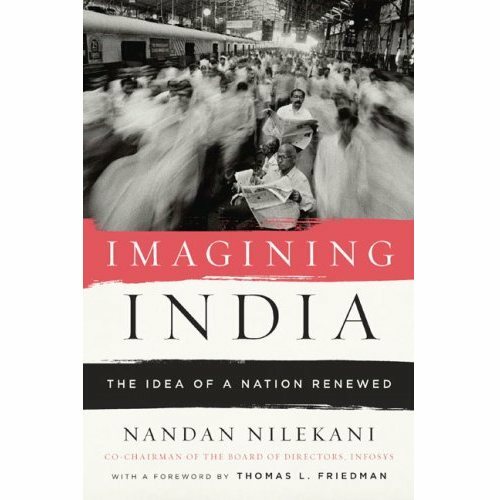 Imagining India is a must read whether you are an Indian citizen or a foreigner who wants to learn out more on this nation’s potential to become a super power. India was from its independence to the 1991 reforms a quasi socialist country with its five-year plans. The reforms allowed the nation to become a vibrant economy welcoming entrepreneurship and international business. Since then, economic growth is relatively important. However there are still many challenges to face: from education and health to infrastructure as well as environmental and energy issues. Each of these topics have their own detailed chapters. India has an unique chance as it can avoid repeating the mistakes done over centuries by Western countries in all the above-mentioned topics and can leapfrog the inefficient and polluting technologies. Two other issues I found impressive are the overwhelmingly bureaucracy that impairs economic development and the role of the English language as a medium toward the end of massive poverty. With its very young population India is a chance for the world as a whole as many nations are aging. As a matter of fact, its economic potential is so gigantic it’s scaring for current economic super-powers such as the United States, the European Union or Japan and China. Closer to the preoccupations of this blog, the last two chapters make me wonder of what would happen if the country begun working as hard on cleantech as it did for the past 20 years on IT. I believe the many local engineers could completely revolutionize cleantech… Indeed, we see throughout the book that India’s IT is efficient and highly innovative. This book also enabled me to better grasp the endless possibilities brought by IT, which is literally at the center of this book. This is normal as Nandan Nilekani has been known for co-founding Infosys, a leading IT company. Conclusion : In my need to better understand the world and after books like Hot, Flat and Crowded ; Guns, Germs and Steel and Collapse, Imagining India brought me a brilliant insight on India. The only drawback I found for this book is that some references are difficult to understand for a complete foreigner like me. I am now looking for similar books on various “developing” countries with a huge potential. If you have ideas of books, I look forward to reading your suggestions.